The Jack Ellis Tabard Overt SRV is worn over clothing and is ideal as protection for front line personnel where there are possible risks that could result in threats from stab, spike, needle or blunt trauma attack. In addition the SRV overt vest can act as a deterrent as well as a means of identifying frontline personnel with the inclusion of badges such as ‘Security’, ‘Trading Standards’, ‘Profit Protection’ etc. The SRV overt vest consists of two detachable parts which are secured using Velcro attachments on the shoulders and around the waist. This enables the wearer excellent adjustment capability to ensure optimum wearing comfort. It is lightweight, and the average weight is approximately 2.65 kg. The vest covers are both hand and machine washable. The Jack Ellis Zip Front Overt SRV is designed for frontline personnel. 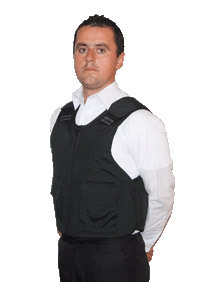 The unique design of the Jack Ellis Zip Front Overt Stab Resistant vest ensures firstly, that protection is not compromised by the zip and secondly, that it easily blends in as part of a uniform. 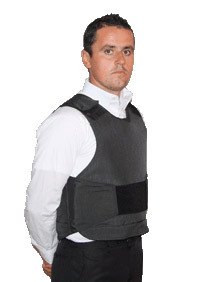 A key benefit of the Jack Ellis Zip Front Overt Stab Resistant Vest is that the armour packs are interchangeable with the Jack Ellis Covert Vest. This feature means that wearers have a covert solution available at a minimal extra cost. The vest covers are both hand and machine washable, and the average weight is approximately 2.70 kg.